"To provide recommendations to develop a viable and sustainable mariculture industry producing shellfish and aquatic plants for the long term benefit of Alaska's economy, environmental, and communities". Pacific oysters ready for Alaskan market. With encouragement from AFDF and the industry, Governor Walker created an Alaska Mariculture Task Force (AMTF). An Administrative Order #280 was signed on February 29, 2016. The AMTF as directed to create a comprehensive plan to boost the mariculture industry, which includes aquatic farming and enhancement of wild fisheries in Alaska. The recommendations developed by the AMTF include details on public and private investments, regulatory issues, research and development needs, environmental changes, public education, and workforce development. Eleven AMTF members, appointed by the Governor, developed the comprehensive recommendations. Advisory committees also assisted the AMTF members with their mission. The AMTF meetings are open to the public. 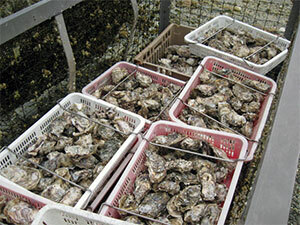 Please enter your email address to receive messages about the Alaska Mariculture Task Force.